Nuclear power is any method of doing work that makes use of nuclear fission or fusion reactions. In its broadest sense, the term refers both to the uncontrolled release of energy, as in fission or fusion weapons, and to the controlled release of energy, as in a nuclear power plant. 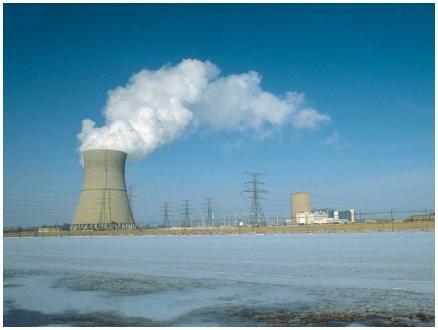 Most commonly, however, the expression nuclear power is reserved for the latter of these two processes. The world's first exposure to nuclear power came when two fission (atomic) bombs were exploded over Hiroshima and Nagasaki, Japan, in August 1945. These actions are said to have brought World War II to a conclusion. After the war, a number of scientists and laypersons looked for some potential peacetime use for this horribly powerful new form of energy. They hoped that the power of nuclear energy could be harnessed to perform work, but those hopes have been realized only to a modest degree. Some serious problems associated with the use of nuclear power have never been satisfactorily solved. As a result, after three decades of progress in the development of controlled nuclear power, interest in this energy source has leveled off and, in many nations, declined. Cladding: A material that covers the fuel elements in a nuclear reactor in order to prevent the loss of heat and radioactive materials from the fuel. Coolant: Any material used in a nuclear power plant to transfer the heat produced in the reactor core to another unit in which electricity is generated. Containment: Any system developed for preventing the release of radioactive materials from a nuclear power plant to the outside world. Generator: A device for converting kinetic energy (the energy of movement) into electrical energy. Neutron: A subatomic particle that carries no electrical charge. Nuclear fission: A reaction in which a larger atomic nucleus breaks apart into two roughly equal, smaller nuclei. Nuclear fusion: A reaction in which two small nuclei combine with each other to form one larger nucleus. Nuclear pile: The name given to the earliest form of a nuclear reactor. Nuclear reactor: Any device for controlling the release of nuclear power so that it can be used for constructive purposes. Turbine: A device consisting of a series of baffles (baffles are plates, mounts, or screens that regulate the flow of something—in this case, a liquid) mounted on a wheel around a central shaft. Turbines are used to convert the energy of a moving fluid into the energy of mechanical rotation. A nuclear power plant is a system in which energy released by fission reactions is captured and used for the generation of electricity. Every such plant contains four fundamental elements: the reactor, the coolant system, the electrical power generating unit, and the safety system. of neutrons available in the reactor and, hence, the rate at which fission can occur. Energy produced in the reactor is carried away by means of a coolant—a fluid such as water, or liquid sodium, or carbon dioxide gas. The fluid absorbs heat from the reactor and then begins to boil itself or to cause water in a secondary system to boil. Steam produced in either of these ways is then piped into the electrical generating unit, where it turns the blades of a turbine. The turbine, in turn, powers a generator that produces electrical energy. Safety systems. The high cost of constructing a modern nuclear power plant reflects in part the enormous range of safety features needed to protect against various possible mishaps. Some of those features are incorporated into the reactor core itself. For example, all of the fuel in a reactor is sealed in a protective coating made of a zirconium alloy. The protective coating, called a cladding, helps retain heat and radioactivity within the fuel, preventing it from escaping into the power plant itself. Every nuclear plant is also required to have an elaborate safety system to protect against the most serious potential problem of all: the loss of coolant. If such an accident were to occur, the reactor core might well melt down, releasing radioactive materials to the rest of the plant and, perhaps, to the outside environment. To prevent such an accident from happening, the pipes carrying the coolant are required to be very thick and strong. In addition, backup supplies of the coolant must be available to replace losses in case of a leak. On another level, the whole plant itself is required to be encased within a dome-shaped containment structure. The containment structure is designed to prevent the release of radioactive materials in case of an accident within the reactor core. Another safety feature is a system of high-efficiency filters through which all air leaving the building must pass. These filters are designed to trap microscopic particles of radioactive materials that might otherwise be released to the atmosphere. Additional specialized devices and systems have been developed for dealing with other kinds of accidents in various parts of the power plant. Types of nuclear power plants. Nuclear power plants differ from each other primarily in the methods they use for transferring heat produced in the reactor to the electricity-generating unit. Perhaps the simplest design of all is the boiling water reactor (BWR) plant. In a BWR plant, coolant water surrounding the reactor is allowed to boil and form steam. That steam is then piped directly to turbines, which spin and drive the electrical generator. A very different type of plant is one that was popular in Great Britain for many years—one that used carbon dioxide as a coolant. In this type of plant, carbon dioxide gas passes through the reactor core, absorbs heat produced by fission reactions, and is piped into a secondary system. There the heated carbon dioxide gas gives up its energy to water, which begins to boil and change to steam. That steam is then used to power the turbine and generator. Safety concerns. In spite of all the systems developed by nuclear engineers, the general public has long had serious concerns about the use of such plants as sources of electrical power. Those concerns vary considerably from nation to nation. In France, for example, more than half of all that country's electrical power now comes from nuclear power plants. By contrast, the initial enthusiasm for nuclear power in the United States in the 1960s and 1970s soon faded, and no new nuclear power plant has been constructed in this country since the mid-1980s. Currently, 104 commercial nuclear power reactors in 31 states generate about 22 percent of the total electricity produced in the country. One concern about nuclear power plants, of course, is the memory of the world's first exposure to nuclear power: the atomic bomb blasts. Many people fear that a nuclear power plant may go out of control and explode like a nuclear weapon. Most experts insist that such an event is impossible. But a few major disasters continue to remind the public about the worst dangers associated with nuclear power plants. By far the most serious of those disasters was the explosion that occurred at the Chernobyl Nuclear Power Plant near Kiev in Ukraine in 1986. On April 16 of that year, one of the four power-generating units in the Chernobyl complex exploded, blowing the top off the containment building. Hundreds of thousands of nearby residents were exposed to deadly or damaging levels of radiation and were removed from the area. Radioactive clouds released by the explosion were detected as far away as western Europe. More than a decade later, the remains of the Chernobyl reactor were still far too radioactive for anyone to spend more than a few minutes in the area. Critics also worry about the amount of radioactivity released by nuclear power plants on a day-to-day basis. This concern is probably of less importance than is the possibility of a major disaster. Studies have shown that nuclear power plants are so well shielded that the amount of radiation to which nearby residents are exposed under normal circumstances is no more than that of a person living many miles away. In any case, safety concerns in the United States have been serious enough essentially to bring the construction of new plants to a halt. By the end of the twentieth century, licensing procedures were so complex and so expensive that few industries were interested in working their way through the bureaucratic maze to construct new plants. Nuclear waste management. Perhaps the single most troubling issue for the nuclear power industry is waste management. 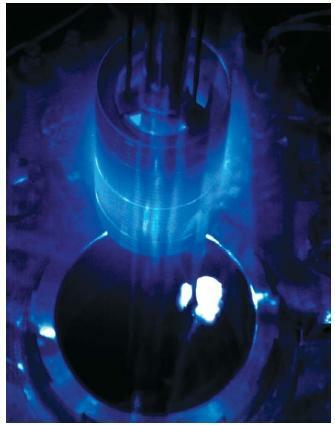 After a period of time, the fuel rods in a reactor are no longer able to sustain a chain reaction and must be removed. These rods are still highly radioactive, however, and present a serious threat to human life and the environment. Techniques must be developed for the destruction and/or storage of these wastes. Nuclear wastes can be classified into two general categories: low-level wastes and high-level wastes. The former consist of materials that release a relatively modest level of radiation and/or that will soon decay to a level where they no longer present a threat to humans and the environment. Storing these materials in underground or underwater reservoirs for a few years is usually satisfactory. High-level wastes are a different matter. The materials that make up these wastes are intensely radioactive and are likely to remain so for thousands of years. Short-term methods of storage are unsatisfactory because containers would leak and break open long before the wastes were safe. For more than two decades, the U.S. government has been attempting to develop a plan for the storage of high-level nuclear wastes. At one time, the plan was to bury the wastes in a salt mine near Lyons, Kansas. Objections from residents of the area and other concerned citizens caused that plan to be shelved. More recently, the government decided to construct a huge crypt in the middle of Yucca Mountain in Nevada for the burial of high-level wastes. Again, complaints by residents of Nevada and other citizens have delayed putting that plan into operation. The government insists, however, that Yucca Mountain will eventually become the long-term storage site for the nation's high-level radioactive wastes. Until then, those wastes are in "temporary" storage at nuclear power sites throughout the United States. The first nuclear reactor was built during World War II (1939–45) as part of the Manhattan Project to build an atomic bomb. The reactor was constructed under the direction of Enrico Fermi in a large room beneath the squash courts at the University of Chicago. It was built as the first concrete test of existing theories of nuclear fission. Until December 2, 1942, when the reactor was first put into operation, scientists had relied entirely on mathematical calculations to determine the effectiveness of nuclear fission as an energy source. It goes without saying that the scientists who constructed the first reactor were taking an extraordinary chance. That first reactor consisted of alternating layers of uranium and uranium oxide with graphite as a moderator. Cadmium control rods were used to control the concentration of neutrons in the reactor. Since the various parts of the reactor were constructed by piling materials on top of each other, the unit was at first known as an atomic pile. The moment at which Fermi directed the control rods to be withdrawn occurred at 3:45 P.M. on December 2, 1945. That date can legitimately be regarded as the beginning of the age of controlled nuclear power in human history. Many scientists believe that the ultimate solution to the world's energy problems may be in the harnessing of nuclear fusion power. A fusion reaction is one in which two small nuclei combine with each other to form one larger nucleus. For example, two hydrogen nuclei may combine with each other to form the nucleus of an atom known as deuterium, or heavy hydrogen. The world was introduced to the concept of fusion reactions in the 1950s, when the Soviet Union and the United States exploded the first fusion (hydrogen) bombs. The energy released in the explosion of each such bomb was more than 1,000 times greater than the energy released in the explosion of a single fission bomb. As with fission, scientists and nonscientists alike expressed hope that fusion reactions could someday be harnessed as a source of energy for everyday needs. This line of research has been much less successful, however, than research on fission power plants. In essence, the problem has been to find a way of containing the very high temperatures produced (a few million degrees Celsius) when fusion occurs. Optimistic reports of progress on a fusion power plant appear in the press from time to time, but some authorities now doubt that fusion power will ever be an economic reality. what about France it nuclear vestment pays off so well it sells more than it uses. thanx for the information.it helped me a lot .continue doing it!!! I always thought that nuclear energy or a substance of some kind of nuclear energy form could be used to be geneticly fused with human DNA to create something different or even more helpful.